Lump sum single balloon payment payday loans with a two-week term have historically dominated the payday loan market. A shift in recent years, due to regulatory or industry changes, has been for payday lenders to make payday loans with longer terms due in multiple installment payments, each due on or around the borrower’s payday. Payday lenders often market these products as a better, more affordable option, even though longer-term payday loans carry triple-digit interest rates, require access to a borrower's bank account to extract payments, and are made with little to no assessment of the affordability of the loan in light of a borrower's income and expenses. This paper seeks to examine the repayment experiences of borrowers of longer-term payday loans in a single state—Colorado. Colorado provides a natural experiment to answer questions about the borrower experience with longerterm payday loans. At the time that the focus groups were conducted, Colorado was the only state where payday lenders could originate only longer-term loans, rather than both short- and long-term loans. 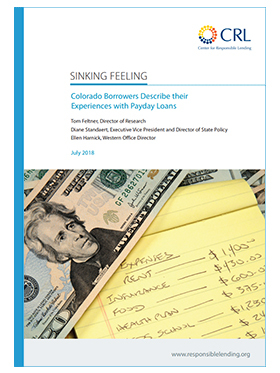 As such, current borrower experiences in Colorado provide insights into the likely borrower experiences in other states where payday lenders have and continue to seek authorization to make longer-term payday loans. This study examines borrower experiences with longer-term payday loans and other household debt through four focus groups conducted in September 2017 in four Colorado cities. Borrowers also discussed their perceptions of other available credit options and their financial well-being through an exit questionnaire.